Bet the Vikings –6.5 over the 49ers at 888Sport. Bet the Texans +6.5 over the Patriots at 888Sport. Bet the Panthers –3 over the Cowboys at 888Sport. Bet the Broncos –3 over the Seahawks at 888Sport. The long summer of waiting and uncertainty now moves to the chance for every NFL team to prove its mettle for real, in games that count. All the roster reshuffling, all the new draft picks, all the important free agents will be on display in new circumstances, creating a lot of mystery. As we get set for the suspense and drama to unfold for Week 1, we surveyed the top NFL betting markets, and these are our best picks against the spread. Although it feels a bit surprising to say it, this is one of the marquee matchups of Week 1. Jimmy Garoppolo lit up the league with the 49ers late last season, as San Francisco won its final five games. Now the Niners are playing for high stakes as they’re considered a playoff contender. Garoppolo will face a lot more tests, and after his great finish to 2017, opposing defensive coordinators will have a lot more material on him and more ways to analyze his tendencies. Without question, this will be arguably the toughest defense Garoppolo has faced. On the flip side, we have the Vikings, who played in the NFC Championship Game and then made upgrades in the offseason. This will be our first regular season look at how they play with Kirk Cousins under center. If they want to prove that they’re again a Super Bowl contender, they can’t lose games like this – no matter how upstart the 49ers are. The Vikings (-6.5) have the more complete roster. Their defense and running game will help control this win and cover. 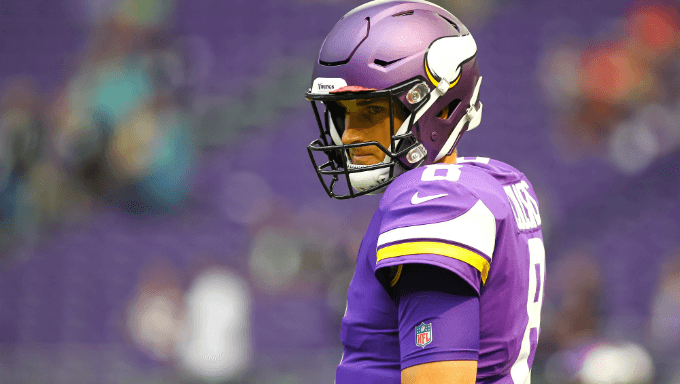 Take the Vikings –6.5 at 888Sport. The Patriots (-6.5) almost lost to Deshaun Watson and Houston at home last year, as Watson busted out and showed just how talented he was as a rookie. That was Watson’s coming-out party as an NFL player, and for that reason alone, Houston certainly has a puncher’s chance in New England. Yet, this is Week 1 of a season and a reminder that when two teams take the field, the Patriots are still the undisputed kings of the AFC, having won the last two conference championships and being the favorite to make yet another Super Bowl. But the Patriots could still win and fail to cover. That’s the feeling in this spot, as the Pats’ offense has some question marks. Running backs Rex Burkhead and Sony Michel should play, but both have minor knee injuries. And the Patriots are also without Julian Edelman, who is often Brady’s security blanket on third downs. The Patriots will find a way to win but a motivated Texans team will keep this close. Bet the Texans +6.5 at 888Sport. The simple reality of this game is that the Cowboys have had multiple members of their elite offensive line either get injured or fall sick. Center Travis Frederick is out. Zack Martin is back but he’s missed ample time in the preseason. Dallas depends on its offensive line to be great in order to make the game easier to process for quarterback Dak Prescott, who regressed in a big way last year after his incredible 2016 rookie season. Going on the road against a stout defense figures to be a big challenge for this offense. The Panthers (-3) were an 11-win team last year, but it doesn’t feel like they’re getting much respect on this betting line. They’re better on both sides of the ball and will show it in this spot. Take the Panthers -3 at 888Sport. The Seahawks are a team in big trouble. They have still not resolved the offensive line problems which plagued them last year. They have totally revamped their coaching staff on offense, hiring a new offensive coordinator and offensive line coach. They are searching for answers and don’t really know what they have. On defense, their once-legendary unit has been dismantled and the lone holdover – star safety Earl Thomas – will begrudgingly play after holding out through all of training camp up, all the way through Tuesday of this week. The Broncos (-3) have flaws of their own but they should be able to run the ball and field the better defense in this one. They’ll win and cover the spread in this spot. Bet the Broncos -3 at 888Sport.